Wood and water don't mix. Prolonged exposure to water will damage a hardwood floor, causing cupping and sometimes even buckling. When wood is exposed to heat, water and humidity, the wood expands due to the increase in its moisture content. The wood boards become wider which often results in cupping or even buckling. Immediate action is important so as to avoid prolonged exposure of the wood to moisture. Different drying methods can be done depending on the size of the area. Small water spills can be dried using soft towels. Air drying and the use of a dehumidifier are solutions too. You can increase air circulation by opening windows and doors or by using fans. Never use heaters for drying the wet area for it may cause permanent damage on the wood. We have worked with many insurance companies to assist Tampa homeowners in the assessment of water damage and the repair of their wood floors. We understand how insurance companies calculate the amount that they are willing to pay for a claim. We are glad to speak directly with your adjuster to help you get reimbursed for all the work that needs to be done to return your wood flooring to its original beauty. "Cupping and crowning" are common complaints caused by prolonged exposure to moisture. Both problems occur across the width of the flooring material. Wood floor cupping is a condition in which the edges of the individual boards are slightly higher than the center. Cupped boards appear to be curled slightly. Increases in moisture or humidity cause a slight expansion of wood flooring, (in fact, any wood) and a decrease causes a slight shrinking. You want to keep water off your floors and follow our instructions on cleaning and maintaining your floors. Also, in building conditions where there is more moisture on one side of the wood flooring than the other, the solid wood flooring can cup. Should exposure to moisture cause cupping, the good news is that sometimes the wood will resume its original size and shape once it has dried. We have special equipment to measure the water content in wood flooring and this measuring is the first step in determining our course of action with your floor. It can also determine whether you have completely handled the cause of your moisture issue. Crowning is the opposite of cupping. Here, the center of a board is higher than the edges. Moisture imbalance is sometimes the cause of crowning if excessive moisture is introduced on the top of the floor, perhaps from water used in maintenance or plumbing leaks from an overhead sprinkler system. However, a common cause is that the floor was previously cupped, but was sanded too soon-before the moisture content returned to normal, and the board had the chance to flatten on its own. 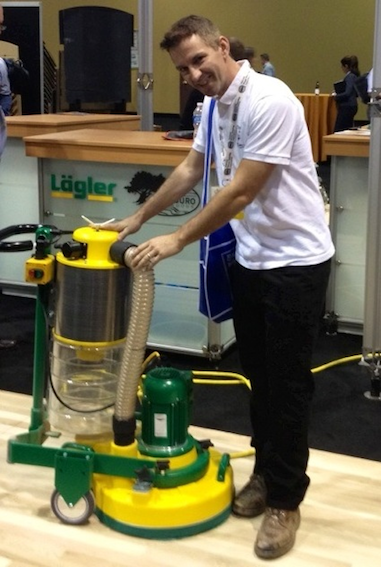 We ensure that your flooring's moisture is at the correct level before we sand. Buckling occurs when the hardwood flooring actually pulls away from the subfloor, lifting up to several inches in one or more places. Fortunately, it is not a common occurrence, happening only after a floor is flooded for a period of time. In flooded hardwood strip flooring, the swelling stress is theoretically high enough for the swelled boards to push out walls. 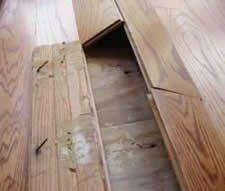 However, before that can happen the nails or the glue holding the flooring to the subfloor will usually give way, so that the floor bulges upward. If buckling floors are caught early, spot repair and replacement may be possible. Once the standing water is removed, several boards may be taken up from the floor so that air can be circulated across and below the floor more effectively. Once the floor has dried to a more stable moisture level, repairs can usually be made. Sometimes, we must replace all the water damaged materials. But often, when a floor is merely cupped, we can just refinish it after it is thoroughly dry. At Through the Woods, we use the most modern equipment, techniques, and materials to create a beautiful and durable, new flooring surface which will be easy for you to maintain. With a minimum of bothersome dust and fumes, we can quickly deliver a glossy floor that will allow you to forget that your floor was ever damaged. The first step is to assess the damage to individual boards. 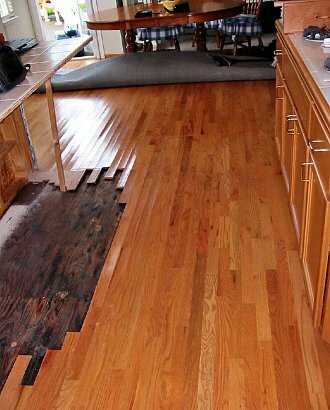 Our carpenters are skilled at removing damaged boards and replacing them with new ones to create an invisible repair in your Tampa Bay hardwood floor. For a prefinished wood floor (one that is stained and coated with a protective finish at the factory), this is often the only step necessary. Generally, but not always, on an unfinished hardwood floor (one that is stained and coated with a protective finish at the jobsite), refinishing is needed to blend the new wood. We belong to the National Wood Flooring Association. This organization sets the standards for our trade and provides us with continuing education on cutting edge technology and products. water damage technologyOur craftsmen attend their schools in Missouri to learn the latest procedures that will allow us to give you a better floor, more rapidly and efficiently. These week long schools offer hands-on training from the top flooring masters in the country. If you choose, we can change the look of your floor, through the application of a custom stain in any color. An Oak floor could be stained to have the richness of Teak or Walnut. Through custom staining we can create a wood floor that is the only one of its kind in Tampa. We can even paint it! The finishing is the last step in the restoration process. The finish protects the wood from wear and keeps it smooth and glossy. Today, there are many types available. We will assist you in choosing the one that will best enhance the beauty of your floor as well as protect it the most effectively. We recommend Bona, a leading manufacturer of wood floor finish and maintenance products, who is constantly researching and improving its formulations. Their finishes have been found to be some of the hardest and eco-friendly available by independent testing services. 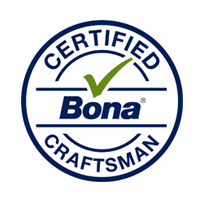 After carefully researching wood flooring businesses, Bona has chosen Through the Woods as one of only a handful of companies in the state to train, certify and recommend. Our employees are among the few brought to Bona's North Carolina technical center, to train and certify in advanced surfacing and finishing techniques. We are experts at returning your floors to their original beauty! Please note: We are not mold experts. With any moisture there is a chance of mold growing, especially here in the humid conditions we often experience in Tampa Bay. We urge you to consult an environmental specialist for mold detection and remediation should you discover water intrusion in your home.